Around 5,000 homes, farms and businesses remain without power because of strong winds overnight. ESB Networks said it has restored power today to a total of 140,000 customers who suffered outages. It said its teams are continuing to work to restore supply in parts of the west and north. The areas worst affected are counties Galway, Mayo, Sligo, Donegal, Cavan and Monaghan. The damage to the electricity network is mainly due to trees falling on overhead lines as a result of high winds. People are advised not to go near fallen trees due to potentially live power lines in the area. The ESB advises anyone who comes across a fallen tree to call 1850-372-999. 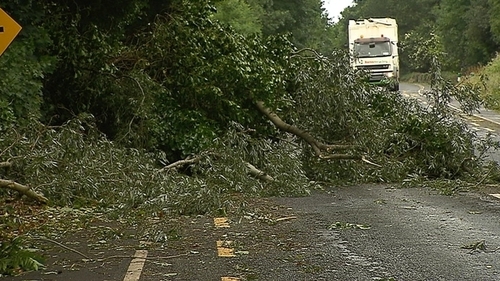 Dublin Fire Service said there were reports of numerous fallen trees across the east of the country. It said Meath and Cavan were worst affected. There are no reports of any major difficulties on roads in the west and northwest. AA Roadwatch said there is damage to the surface of the Ballybay Road (R183) outside Clones due to the bad weather and the road is passable with care. Met Éireann issued two weather warnings yesterday ahead of Storm Hector, which was expected to bring gusts of up to 125km/h in parts of the south and northwest. Both were lifted this morning.